Was pretty good. A little angsty but the characters did learn and grow All in all a good read. Full of heartfelt emotion and self examination, Keep Me, Cowboy is an exquisite story. This is a book that leaves the reader pondering: what would I do in the same situation? Cole and Jess both showed courage in the decisions they made. Jess was willing to put her feelings aside to heal a rift between a family that needed each other. Cole broke his own heart in making the decision to remove himself from a desperate situation in the past. Keep Me, Cowboy is about finding the strength to stay despite the temptation to leave. 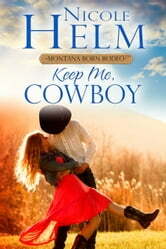 I received an ARC of Keep Me Cowboy by Nicole Helm in exchange for an honest review.